Gmail invites for spreading Firefox! The Spread Firefox Community has started giving out gmail invites for those who promote Firefox on the web. Sounds like a very nice campaign to enlighten people about this nice browser. Read more about Gmail invites for spreading Firefox! Searching for Bhagavat gita? Here it is! 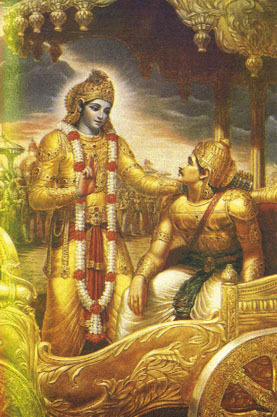 Shri Madhbhagavat Gita in Sanskrit (the original form) is available on the net on wikisource! It has been typed in Devangari script and is available under GPL here nice, ha? ;) UPDATE: Vishnu sahasra nama Stotram is also available at wikisource! woohoo! This is the link to it. Those who can't read sanskrit, can go here MORE UPDATE: Few Other Websites where you can find Shri MadhBhagavadhgita... http://sss.vn.ua/bg_roman.htm - in roman - sanskrit script! http://www.iconsoftec.com/gita/ - Some nice photos here. http://www.dharmakshetra.com/gallery/Picture%20Gallery-0002.html - A very Nice Picture Gallery hosting few very nice photos related to Bhagavat gita and others. http://malkan.com/ - Multimedia version of Bhagavat Gita! Read more about Searching for Bhagavat gita? Here it is! Few weeks back, an e-mail had crowned me a winner of some lottery I never heard of or participated in... Today, I get this ;) damn, the spam!